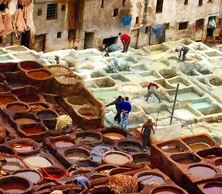 Morocco's sensuous beauty is legendary, from imperial cities with labyrinthine and souks to the awesome grandeur of the Sahara. Our journey begins in Marrakech and takes us across the Tizi n'Tichka pass to the outskirts of Ouarzazate, which is now a small Moroccan Hollywood (numerous films took place, and are still shot here). In the afternoon we continue to The Dades Valley is an amazing area in the High Atlas Mountains - a photographer's paradise! The valley has lush green fields, spectacular gorges, and slot canyons of rose-coloured sandstone. The Dades Gorge has a fairy-tale feeling and the strength of the colours will never escape your memory. The Dades area is filled with lush valley oasis towns and many of the Kasbahs are in ruin, contributing to the mysterious atmosphere. We settle at the foot of Erg Chebbi where Morocco's tallest sand dunes stretch to the horizon and admire the magnificent sunset. The next morning we try not to miss the sunrise over the Erg Chebbi dunes. They stretch over kilometres and kilometres and are sublime at sunrise as they change colours from pink to ochre and from red to orange. We cross the desert where only few villages brave those difficult living conditions. 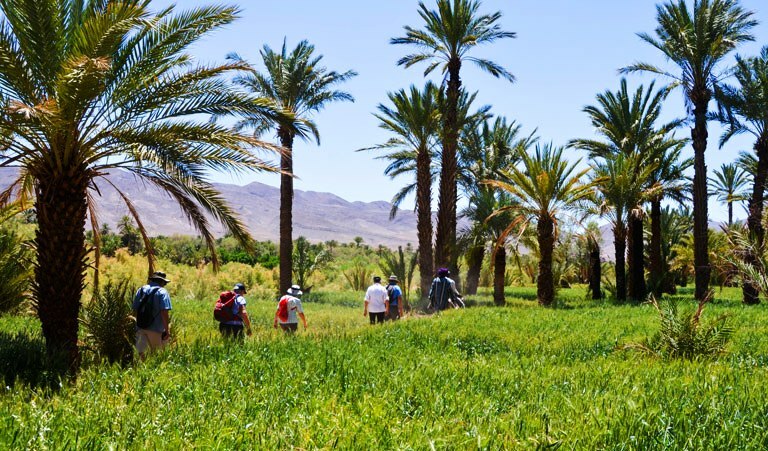 Eventually we enter the Draa valley and the oasisi of Agdz, located in a vast palm grove on the old caravan route, liking Marrakech and Timbuktu and renowned for its fine dates. We leave Agdz and travel north through the lush Draa Valley and travel to the lovely town of Ouirgane. It is all surrounded by the High Atlas Mountains, in the heart of the Berber country. Ouirgane is also known as a health resort, perfect to enjoy the spa and yoga. Together, with our local guide, we discover the Toubkal National Park in the High Atlas Mountain range. It covers an area of 100,000 hectares and boasts the highest mountain peak in North Africa, Jbel Toubkal, 4167 metres (13750 ft) high. Our last day takes us to Marrakech where our journey ends. From the dining room of our Kasbah in the Dades Valley we enjoy panoramic views and savour some of the country's traditional cuisine - a delicious couscous, the famous Pigeon Pie, the Moroccan soup, Harira, or the many varieties of Tagine with meat. In Erg Chebbi we spend two nights in the renovated Tombouctou guesthouse. Its privileged location near the sea of dunes is just magical. In Agdz we stay in a beautiful, newly built Kasbah for 3 nights. Our peaceful hotel, inspired by many Moroccan Kasbahs, is in the heart of the palmarie and has a scrumptious restaurant, which opens up to the pool area. It offers fine Moroccan cuisine but we might also escape for one night to the more familiar European cuisine. In Ouirgane, at an altitude of 1,000 metres, our charming hotel is secretly hidden in the middle of sixty acres of natural parkland. 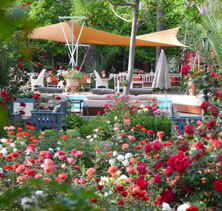 All rooms and suites open on patios and terraces surrounded by thousands of rose bushes. There is also a very inviting spa and pool! 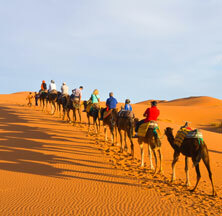 Departure dates have been arranged to allow the "Mystical Morocco" and "Jewels of the Balearic" walks to be combined. I must start by saying how well our leader was. For me collecting me from Malaga airport was so kind and wonderful. On the whole our accommodation was wonderful and the food we had was excellent. it was just lovely meeting likewise people who loved wine, food and exploring. The part of Spain I went to was lovely, walking through the lime stone near Rhonda was most amazing, Lovely food and wine and lots to see. I just loved Morocco and the people. Somewhere I have also wanted to go. Fez was very interesting - seeing all the spices, food etc in in the Medina was wonderful. Most of all I loved being in the Atlas Mountain area - just seemed to remind me of times in the biblical eras. The food there was delicious and seeing how the little villagers lived their lives, was amazing - the fruit and veggies they grow, washing their clothes, knowing their children will be well educated, woman's health is good, and most of all they seemed happy. We had storms, snow, cloudy days and and sunny days. The last day took us to the tallest mountain in Morocco, a very special place, climbing to a beautiful retreat area with morning tea served. We were lucky there was a lot of snow and that the clouds cleared enabling us to see the top of the mountain. I will remember that day forever. Just so quiet and beautiful. I brought a small mat going down the track to remember the day. Our guide through the trip was always there for us, no matter what came up. A wonderful holiday - thank you Walkabout Gourmet Adventures." A really interesting trip following the Moorish influence in Spain and then travelling to Morocco... what a fascinating country. A good balance exploring 2 countries and the historical links. There was some fairly challenging walking in Spain in the mountains (more difficult than I expected) but this contrasted with the very pleasant walks in Morocco, mainly in the valleys among the communal gardens of the local villages... very lush and green with lots of birds and often seeming like an oasis in the desert." Gilles was a great guide and we enjoyed the trip!" Brilliant guides, fabulous accommodation, exotic luscious food. Thank you Gabriella and Giles for leading this "mature" trekker on the walk of her life. How I wish I had started 30 years ago. I am almost prepared now for more mountaineering rather than the envisaged walk in the plains of Spain. Truly a great and very happy experience with so many shared exciting memories". This trip was superb! Glorious days walking in the Sierras of Spain, with some snow still on the mountains, walking the mountains and valleys of the Grazalema Natural Park, the magic of waking up in the Alhambra Palace in Granada, exploring Sevilla, all were exceptional experiences. Then came the mysteries of Morocco- being led through the intricacies of the Medina of Fes, arriving at Boumaine in the High Atlas range after travelling through the striking Dades Gorge, finding ourselves in the desert with dunes at Erg Chebbi, riding lurching camels into the dusk and setting sun, the tranquillity of staying in oasis and exploring the date plantations with an exuberant guide, the vibrancy of Agdz, and the calmness of Ourigane with memories of a guided walk through Berber villages. There were so many stunning sights, fairytale experiences, and I saw things I had only ever imagined before. It was a very satisfying tour well-planned and led by Gabriela and Gilles, great guides, with unique accommodation that in itself was memorable." The holiday was extremely interesting in that the places we visited and the hotel stays were well selected, typical of the areas, varied and off the beaten track. With the exception of a few meals, very good food, and were the cuisine of the places we stayed at. The group size was large enough. Transport in the mini-buses was very comfortable. The walks were in places less visited which made them adventurous and gave us a different perspective of the local environments to that of just skirting around towns and villages, and gave a closer look at the landscape and how people in less populated area lived. The trip was well thought out and unique. Thank you." We loved our walking tour of Spain & Morocco with Gabriela & Gill. They were both so accommodating and nothing was too much trouble. The walks were varied and Interesting with knowlagable guides. We would have liked to start the walks earlier than 9.30 - 10 as it was often hot and we didn't have enough time to enjoy the beautiful accommodation at the end of the day. The buses could have been more comfortable for those in the back seat, we had some long days and they felt every bump. I was lucky as I travelled in the front due to motion sickness. We had some long days in the bus but we covered a lot of country in Morocco which was really interesting and scenic. There was always a jewel at the end of the day as we stayed in some beautiful places. I really liked the lunches where we did the shopping and had picnics in the countryside.I realise that was difficult in Morooco. I think the meals could have been more varied eating where the locals eat,as we often ate in large dining rooms more than once at the same place. I would recommend Gourmet walkabout to my friends & hope to do another trip with you.)" Where to start?… so many highlights made up our wonderful trip to Spain and Morocco! A lasting impression for me is of the views high up in the Sierra Nevada and Atlas Mountains and looking down to the lush, fertile valleys below. We loved walking through the market gardens and villages where just about anything seemed to grow and covered every pocket of arable land. The changes in architecture and construction as we moved from Andalucía to Morocco were fascinating and the explanations about village life and culture by our local guides added to our enjoyment. The trip included wonderful cities like Granada and Fes as well as a surprise on our first night to find our hotel overlooked the sparkling sea in San Jose and time for a dip in the sea. Four nights were spent in a rustic hotel in the countryside near Órgiva in the Alpujarra mountains - the setting for Chris Stewart's book 'Driving Over Lemons". We enjoyed relaxing in the beautiful garden after a day's walking and sipping very large G&Ts! Thank you Gabriela and Gilles for a wonderful holiday and great time!" What a fabulous 21 days! Great Guides, Accommodation, Food, Company, Walks, Loads of fun and laughter and quite overwhelmed by the magnificence of the Andalusias and Morocco. Bring on Jordan next :)"
An absolutely wonderful trip with a marvellous guide. A huge number of experiences packed into 3 weeks of travel. Excellent walking, great food and wonderful contrasts in accommodation from the rustic and immensely enjoyable Berber village, Tamerloute in the Valley of the Roses to the luxury of the stunning Parador at the Alhambra in Granada. 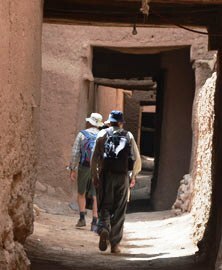 The local guides in Morocco were interesting and entertaining, the schedule very well planned and the walks were of a good level for a medium walker.